Until two days ago Kevin Ryan was head of the Environmental Health Laboratory Div. of Underwriter's Laboratory. That is the lab that originally had certified the steel that the World Trade Center was built with. He had recently written a memo to Frank Gayle of the National Institute of Standards and Technology questioning that the steel had failed in the WTC 1 and WTC 2 collapses due to the burning jet fuel. I'll include his memo below. He simply points out that the information doesn't match what his lab knew about the steel, and that the official reports are based on ideas that have nothing to do with the known laws of physics. I.e. the possible temperatures of burning fuel and the temperatures at which steel might possibly be softened. That has been mentioned before, of course, but experts in the right positions have stayed strangely quiet. So I guess this guy needed to be shut up too. Doesn't sound like he'll be very quiet, though. Having recently reviewed your team´s report of 10/19/04, I felt the need to contact you directly. As I´m sure you know, the company I work for certified the steel components used in the construction of the WTC buildings. In requesting information from both our CEO and Fire Protection business manager last year, I learned that they did not agree on the essential aspects of the story, except for one thing - that the samples we certified met all requirements. They suggested we all be patient and understand that UL was working with your team, and that tests would continue through this year. I´m aware of UL´s attempts to help, including performing tests on models of the floor assemblies. But the results of these tests appear to indicate that the buildings should have easily withstood the thermal stress caused by pools of burning jet fuel. There continues to be a number of "experts" making public claims about how the WTC buildings fell. One such person, Dr. Hyman Brown from the WTC construction crew, claims that the buildings collapsed due to fires at 2000F melting the steel (1). He states "What caused the building to collapse is the airplane fuel . . . burning at 2,000 degrees Fahrenheit. The steel in that five-floor area melts." Additionally, the newspaper that quotes him says "Just-released preliminary findings from a National Institute of Standards and Technology study of the World Trade Center collapse support Brown´s theory." The results of your recently published metallurgical tests seem to clear things up (3), and support your team´s August 2003 update as detailed by the Associated Press (4), in which you were ready to "rule out weak steel as a contributing factor in the collapse". The evaluation of paint deformation and spheroidization seem very straightforward, and you noted that the samples available were adequate for the investigation. Your comments suggest that the steel was probably exposed to temperatures of only about 500F (250C), which is what one might expect from a thermodynamic analysis of the situation. However the summary of the new NIST report seems to ignore your findings, as it suggests that these low temperatures caused exposed bits of the building´s steel core to "soften and buckle"(5). Additionally this summary states that the perimeter columns softened, yet your findings make clear that "most perimeter panels (157 of 160) saw no temperature above 250C". To soften steel for the purposes of forging, normally temperatures need to be above 1100C (6). However, this new summary report suggests that much lower temperatures were be able to not only soften the steel in a matter of minutes, but lead to rapid structural collapse. This story just does not add up. If steel from those buildings did soften or melt, I´m sure we can all agree that this was certainly not due to jet fuel fires of any kind, let alone the briefly burning fires in those towers. That fact should be of great concern to all Americans. Alternatively, the contention that this steel did fail at temperatures around 250C suggests that the majority of deaths on 9/11 were due to a safety-related failure. That suggestion should be of great concern to my company. Thanks for your efforts to determine what happened on that day. You may know that there are a number of other current and former government employees that have risked a great deal to help us to know the truth. I´ve copied one of these people on this message as a sign of respect and support. I believe your work could also be a nucleus of fact around which the truth, and thereby global peace and justice, can grow again. Please do what you can to quickly eliminate the confusion regarding the ability of jet fuel fires to soften or melt structural steel. The PBS documentary revealed that the use of 3/4" bolts hold the steel joists in place were up to the task even of the steel was up to code. That the bolts were *not* up to code, even if the steel itself were? See, that's the kind of thing that might actually explain it, without conspiracies. But not as long as the official explanation still is that the heat from burning fuel melted the supporting beams. 18 Nov 2004 @ 03:30 by bushman : Another Therory not talked about. Is, that under the WTC's towers was the subway system, also the towers were built around a central core suport system, the central core was basicly hollow fuel ran down the core, and acted like a blast furnace in a way, like the flu of a chiminey, the fire could of been hot enough to melt the steel. If they had drop down doors at the subway platforms, that sealed off air flow from the bottom, the fires would of starved and never got hot enough. That just doesn't fit with the physics of burning fuel. Yes, one found, several months later, a lot of molten steel in the foundation. Which couldn't really have been caused by burning fuel, however much oxygen it had. But if nobody had thought about the bolts that held the whole thing together, and the bolts melted at a different temperature, that could be a reasonable explanation. I haven't seen anything on that. The buildings were built to high standards of being able to withstand even extreme events. It could entirely be possible that the standards were wrong, and one had discovered conditions that would be catastrophic. But the very suspicious thing is that they didn't. If the norms were wrong, somebody should be rewriting the text books. Just like when a bridge unexpectedly fell down because it started swinging at a certain frequency in certain types of wind. One had to revise the rules of building bridges, and the mistake wouldn't have to be made again. So far nobody has pointed out any mistake in the construction of the WTC that would add up to revising the methods it was constructed with. in the lower levels below the street. I found this today. Maybe this guy's letter should get him fired. Why didn't he just email Gayle with his questions instead of suggesting so much? He goes on about emotions and 9/11, and suggests Gayle may be spreading disinformation. Ryan's points/questions seem valid, which make his letter that much more tragically nulled, to an extent. Maybe he should've kept it short, AND consulted his boss before he sent it. Maybe Ryan felt responsible himself, as his company certified the steel that the NIST said failed. One thing is sure though, the NIST should provide an acceptable answer to Ryan's questions. 16 Dec 2006 @ 22:16 by Gregg Roberts @66.69.204.254 : Where Are the 9/11 Whistleblowers? WTC stories vertically on top of the original WTC skyscraper. Therefore how could 10 to 25 stories get enough enough momentum to initiate total collapse of the remaining, basically unblemished, majority of the building below it. The Physics 'Normal' upward supporting force was thousands of times greater than the downward Gravitational force of the upper portion of the building. The case rests there. The basic laws of Physics cannot be broken. Newton's 3 laws of motion and the Conservation of Momentum Law and the Conservation of Energy Law simply cannot be broken because the Government and the Media propaganda to the contrary. I think a person needs a Physics background, who is able to apply the Laws of Physics, theoretically and/or mathematically to truly understand what is going on with the collapse. Only powerful steel cutting explosives can come close to explaining the total collapse the the WTC 1 and WTC 2. Dosnt take a PHD to see what they did. This is to edit or revise and correct my initial input statement of 6-28-08. (110 x 19 = 2,090) additional WTC stories vertically on top of the original WTC skyscraper. Therefore how could 15 stories from the South Tower or 30 stories from the North Tower gain enough acceleration and momentum to initiate total collapse of the remaining, basically unblemished, majority of the building below it. 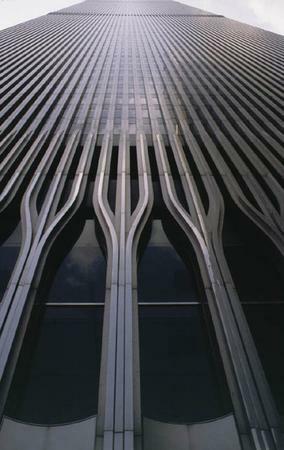 The Physics 'Normal' Force Vector upwards is the supporting force for the lower undamaged portion of the WTC. The upward supporting force vector for the South Tower is calculated to be 46 times greater that the downwards Gravitational Force Vector of the 30 stories of the upper portion. The upward supporting force vector for the North Tower is calculated to be 127 times greater than the downwards Gravitational Force Vector of the 15 stories of it's upper portion. The case for Impossibility of Collapse rests there. The basic laws of Physics cannot be broken. Newton's 3 laws of motion and the Conservation of Momentum Law and the Conservation of Energy Law simply cannot be broken because the Government and the Government supporting Media propagandize to the contrary. I believe a person needs a Physics background, who is able to apply the Laws of Physics, theoretically and/or mathematically, to truly understand what is going on with the mechanism of collapse. Only very powerful high temperature steel-cutting explosives can come close to explaining the total collapse of the WTC 1 and WTC 2. Let’s just face a few simple facts. Skyscrapers MUST hold themselves up. They must also sway in the wind. The people who design skyscrapers MUST figure out how much steel and how much concrete they are going to put on every level before they even dig the hole for the foundation. After EIGHT YEARS why don’t we have a table specifying the TONS of STEEL and TONS of CONCRETE that were on every level of WTCs 1&2? The NIST report does not even specify the TOTAL for the concrete. The total for the steel is in three places. So even if the planes did it that 10,000 page report is CRAP! Conspiracies are irrelevant. The Truth Movement should be marching on all of the engineering schools in the country. Watch that Purdue simulation. If a 150 ton airliner crashes near the top of a skyscraper at 440 mph isn’t the building going to sway? Didn’t the survivors report the building “moving like a wave”? So why do the core columns in the Purdue video remain perfectly still as the plane comes in? That is the trouble with computer simulations. If they are good, they are very good. But if they have a defect either accidental or deliberate they can be REALLY STUPID once you figure out the flaws. The distributions of steel and concrete are going to affect the sway of a skyscraper whether it is from the wind or an airliner. How much does one complete floor assembly weigh? You know those square donut floor slabs? They were 205 ft square with a rectangular hole for the core. There was a steel rebar mesh embedded in the concrete which was poured onto corrugated steel pans which were supported by 35 and 60 foot trusses. There has been talk about those things pancaking on each other for years. But has anyone ever said what the whole thing weighed? Why haven't we seen that A LOT in EIGHT YEARS? The concrete alone is easy to compute, about 601 tons. But the concrete could not be separated from the entire assembly, the knuckles of the trusses were embedded in the concrete. So what did the whole thing weigh and why haven't the EXPERTS mentioned that A LOT? So why hasn't Richard Gage and his buddies produced a table with the TONS of STEEL and TONS fo CONCRETE that were on every level of the WTC? How much computing power do they have compared to the early 1960s when the buildings were designed? I asked Gage about that in May of 2008 at Chicago Circle Campus and he got a surprised look on his face and gave me this LAME excuse about the NIST not releasing accurate blueprints. Gravity hasn't changed since the 1960s. They should be able to come up with some reasonable numbers.